Fall's first weekend was a very busy weekend! Unfortunately, I wasn't busy sewing. On Saturday, I took the kids apple-picking like I do every year and we had a wonderful time. 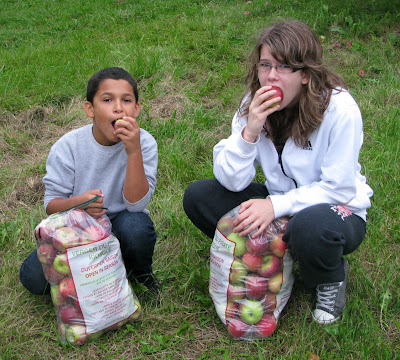 Then we spent the rest of the day baking... apple bread, apple crisps, apple muffins and, of course, apple pies. I managed to get some sewing done on Sunday and was able to finish the centre of Hubble, my Schnibble for October. When I get to the cottage this weekend, I'm hoping to be able to add the borders. 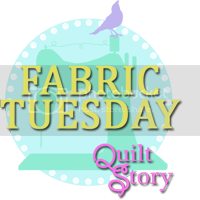 There probably won't be a lot of sewing this weekend either because I have a birthday party to go to on Saturday and then we have to be back in the city early on Sunday because my daughter has a school project to work on with some of her friends. Speck - Quilted and Ready for a Parade! In case you missed my previous post about this little quilt, I used a charm pack called Portugal and the background, border and binding came from my stash. 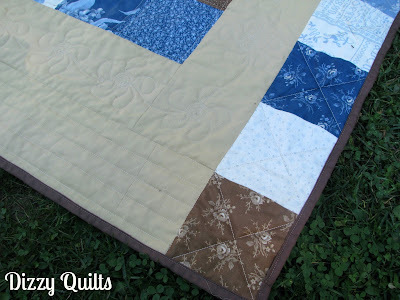 I quilted in the ditch around each X block and then did some straight line stitching on the diagonal. I was done with this little Schnibble on Saturday, so on Sunday, I decided to start cutting into my Sentiments charm packs and get a head start on the October Schnibble... We were given the choice between two patterns for next month: Bounce or Hubble. I decided to go with Hubble. 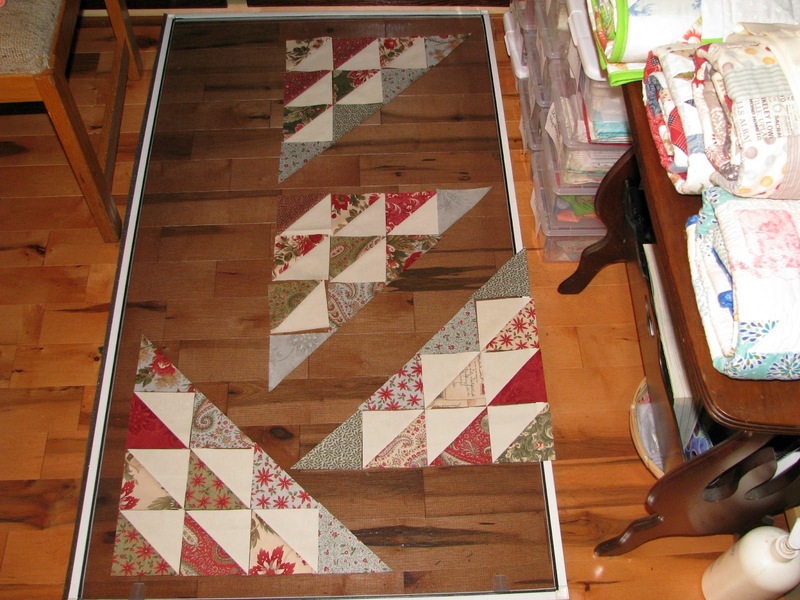 I spent hours on Sunday cutting and then piecing a bunch of HSTs! But this Schnibble is going to be so nice. For my first try at completing this pattern, I decided to use fabric I really didn't pay a lot of money for and wasn't particularly attached to. I wanted to make sure I had the skills needed to make the bag without making a huge mess out of it before cutting into my more expensive fabric. 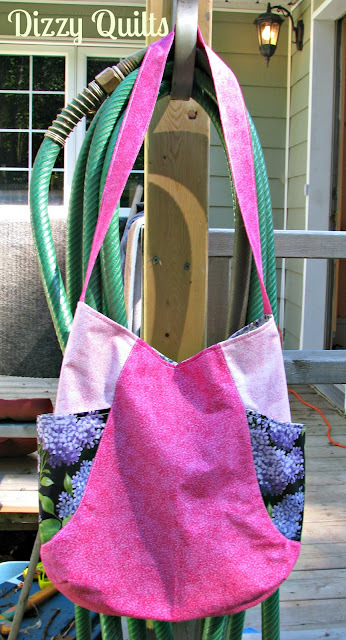 I also wanted to see how long it would take me to make one of these bags because I was thinking of making one for the ladies in my life as Christmas gifts. A little over a month ago, I chose the fabric and cut all the pieces I would need to make the bag. Then I realized I didn't have any interfacing or magnetic snaps. So I put the pieces and the pattern into one of my storage bins and it stayed there for a couple of weeks. Last weekend, I pieced about half the bag. I blogged about it here. And this weekend, I finally finished it. 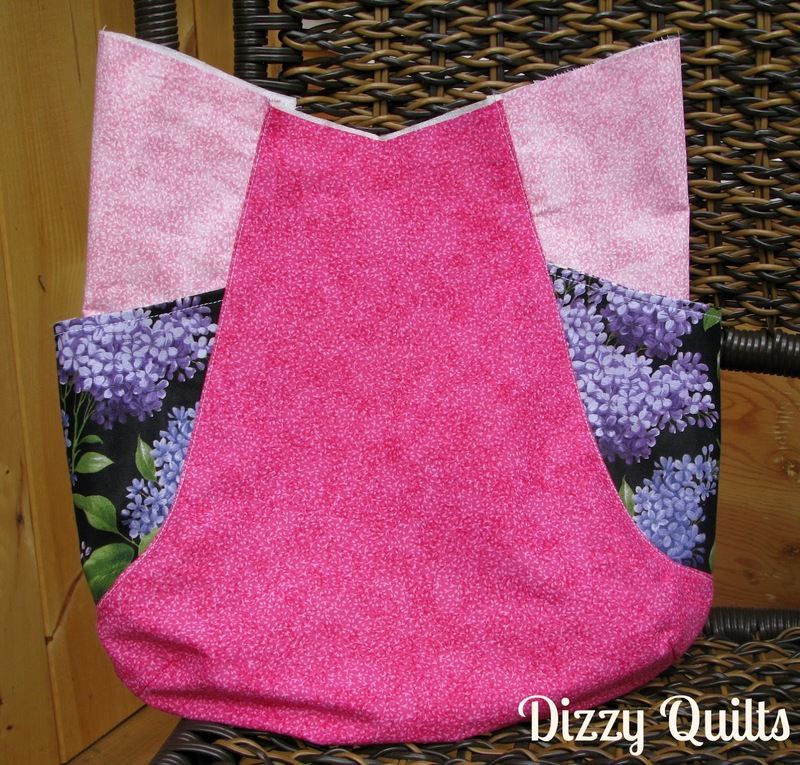 I made the version with the exterior pockets, but chose not to add the zipper pockets. I love this bag! Not because of the fabric I chose, but the structure and the size are absolutely perfect. I'm really not a fast sewist and this bag came together really fast (once I had all the materials needed!) and easily. 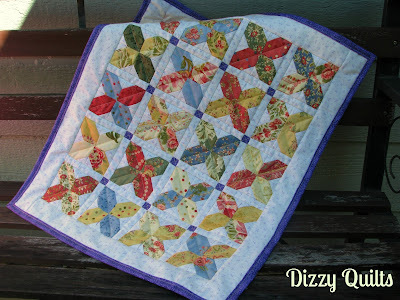 This would be a perfect gift and I cannot wait to get started on making more! Last weekend, after completing my Speck top (you can read all about it here), I decided it was time to start piecing my 241 Tote Bag. I purchased the pattern a while ago and as I said in a past post, I wanted to try out the pattern with fabric I wasn't particularly attached to... just in case it didn't come out the way I expected (read: in case I messed it up too badly!). I managed to get the body of the bag done before leaving the cottage for the week. 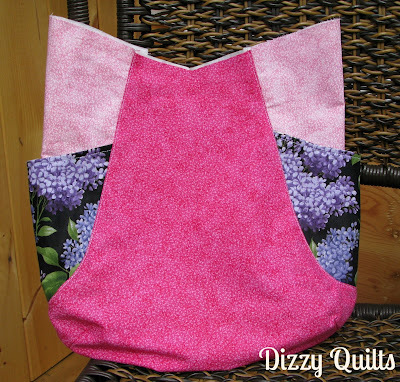 I have to be honest, sewing this bag was a bit of a challenge for me at first. Nothing to do with the pattern or the instructions - more like my brain wasn't functioning properly. But I persevered and so far, I'm really liking the structure of the bag (not so much the fabric choices!). I can't wait to see how the rest of it goes. If it doesn't take me too long to finish, I'm thinking I might make a few to offer as Christmas gifts this year. 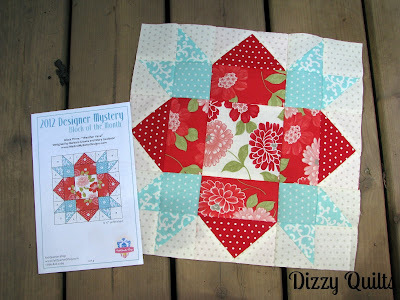 Konda who blogs at Moose on the Porch Quilts has her very own book out! She is also hosting a wonderful "Mini" Quilt Along which starts in a couple of weeks. 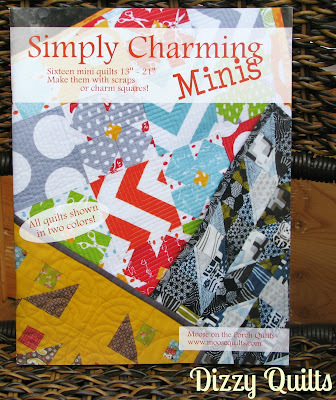 I'm still debating whether or not I'll be joining the quilt along, but I'm definitely going to be making a few of these minis... they are gorgeous and perfect for charm packs (and I've got LOTS of those!). 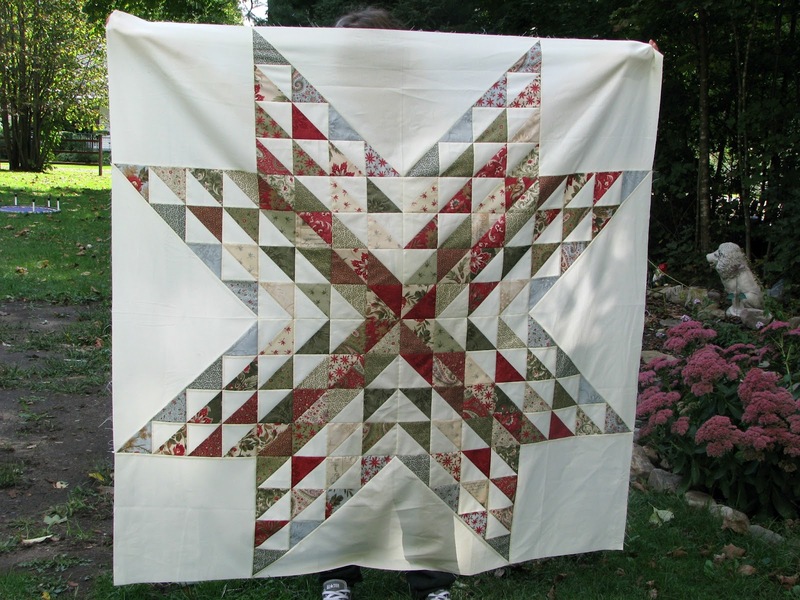 To get all the details of the quilt along, go here. A Little Speck in Portugal! When I got to the cottage Friday night, the first thing I did (after unpacking of course), was go to my stash of charm packs to choose the fabric I would use for Speck. I debated for a bit, but in the end, I decided to go with a charm pack I received as part of a swap - Portugal - designed by April Cornell for Moda. The finished top measures 16" x 24"; perfect for a small table topper or wall hanging. I'm thrilled that the top went together so fast - maybe this month, I'll be able to quilt this little Schnibble before the parade! WIP Wednesday - A Finish! 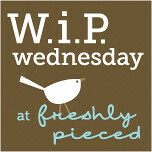 I'm so happy to have a finish to show you this week! I made this quilt for my friend and boss who turned 50 on August 23 (yes, I know - she got her present a couple of weeks late!). She was super excited to receive it! 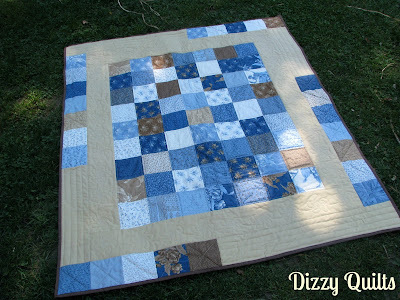 I love giving quilts to people who actually appreciate how much love and work go into creating one of these. I used Blueberry Crumbcake charm squares for this quilt. The pattern is from the Moda Bakeshop and was designed by Kim Niedzwiecki. I didn't follow the pattern exactly - I decided against adding the last border. So my finished quilt measures about 60" x 53". The perfect size to cuddle under while watching TV on a cold night. 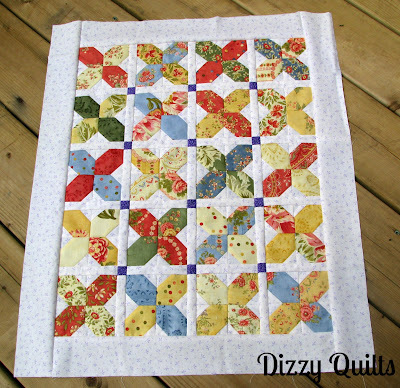 I quilted with some straight lines in the centre blocks and then again in the outer border. In the middle border, I chose a cute whirlygig design. I didn't have a large enough piece of fabric for the backing and really didn't have time to order anything online so decided to buy a good quality sheet and use that as the backing. The rest of my projects haven't been touched or even looked at in weeks now so they hardly qualify as WIPs... they are basically on the verge of becoming UFOs at this point! 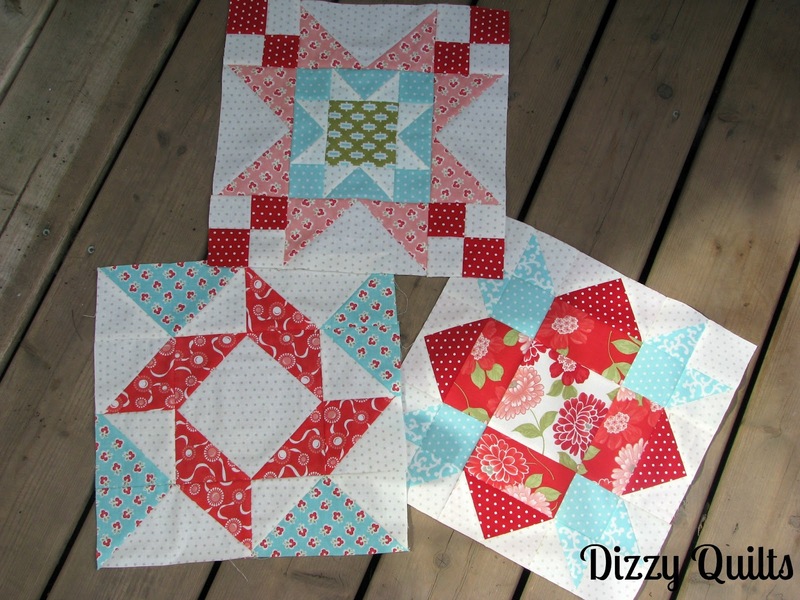 Linking up at Freshly Pieced! Things have been more than a little hectic around here since my vacation ended and I went back to work on August 20. First, I had to fly to Jersey City for work and I was there for almost a week. I loved Jersey City - it reminds me of Montreal a little bit. After I got back from Jersey, the kids started school. So my weekend was spent shopping for running shoes, making sure all the school supplies, school uniform, etc. were in order and basically getting the house organized for back to school. And then my first week back at the office was totally crazy! When I got home from work at night all last week, I was so tired I just sat down for dinner, walked the dog, cleaned up the kitchen and basically crashed on the couch to watch TV. So I have not been blogging, emailing or reading blog posts for a couple of weeks now. I feel totally disconnected from the wonderful people I met in blogland! I'm hoping to catch up on all my reading this week. With a 3-day weekend though, I was able to get some sewing done. 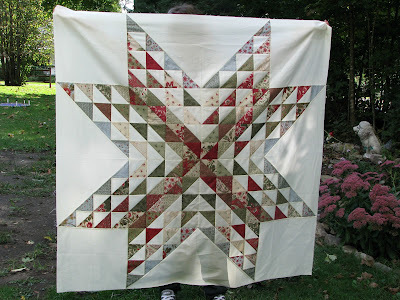 I finished the Happy Weekender, the quilt I was making for my boss. I will post pictures of it right after it is washed and dried. Also, while I was away, I received Block 3 of the Fat Quarter Shop's Mystery Designer BOM. 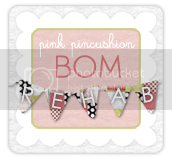 Linking up at Pink Pincushion for BOM Rehab! I'll be back later this week to share pictures of the Happy Weekender!